Following several deadly attacks on Christians in Pakistan, St. William Parish will host a prayer vigil on Saturday, April 21 from 6 p.m. to 7 p.m. in its lower church, located at 6200 Rising Sun Avenue in Philadelphia. In December 2017, two suicide bombers killed nine people and wounded over a dozen at a Quetta church packed with worshippers. Just after Easter Sunday 2018, a Christian family of five was shot by men claiming to be members of ISIS. Four were killed; a young girl survived with injuries. On April 15, 2018, gunmen opened fire on a group of Christians standing near a church. Two men were killed; three other individuals, including a woman and a child, were injured. 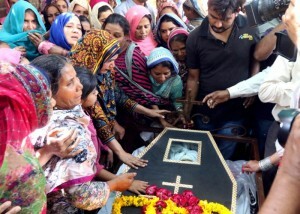 The parish’s 5 p.m. Vigil Mass, which will precede the prayer vigil, will also be offered for Christians in Pakistan. For more information, call the rectory at (215) 745-1389 or visit www.churchofstwilliam.com.